The five extant species of the Gaviiformes are foot-propelled diving birds of the Northern Hemisphere which breed in northern freshwater sites but winter along sea costs in temperate areas. Loons are among the few neornithine birds with a putative late Cretaceous fossil record (Chap. 4). Whereas these Cretaceous remains stem from deposits of the Southern Hemisphere, all Paleogene fossils are from fossil sites in Europe and, possibly (see below), North America. The earliest described Northern Hemisphere species of the Gaviiformes is Colymboides anglicus Lydekker, 1891 from the late Eocene (MP 17; Mlikovsky 2002) of England, which is represented by a coracoid, a referred humerus, and a portion of the frontal bones of the skull (Harrison 1976; Harrison and Walker 1976a). The fossil record of ?Colymboides metzleri Mayr, 2004 from early Oligocene (Rupelian) marine sediments of Germany is more substantial, and consists of an incomplete disarticulated skeleton (Mayr 2004b). This species is smaller than C. anglicus and is only about half of the size of the smallest extant loon, the Red-throated Diver (Gavia stellata). It is distinguished from the similarly sized early Miocene C. minutus Milne-Edwards, 1867 in a more protruding and narrower process formed by the cnemial crests of the tibiotarsus, and a proportionally shorter femur and longer tarsometatarsus. These presumably derived features are shared with extant Gaviidae, for which reason ?C. metzleri may actually be more closely related to Gavia than to Colymboides (Mayr 2004b). In the holotype specimen of ?C. metzleri stomach content is preserved. It consists of numerous fish bones and shows Paleogene loons to have been piscivorous like their modern relatives. Another Paleogene species of Colymboides, C. belgicus Mayr and Smith, 2002, was described from lacustrine sediments from the earliest Oligocene of Belgium, and is based on a proximal carpometacarpus and a distal ulna (Mayr and Smith 2002b). C. belgicus was only slightly smaller than G. stellata, but in the Brussels Natural History Museum there are remains of another as yet undescribed and very small gaviiform from Rupelian deposits (personal observation). 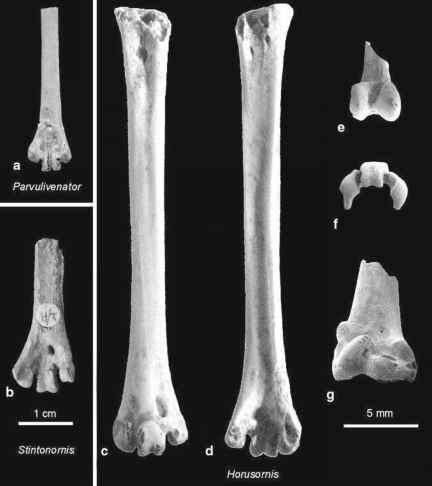 An undescribed leg of a small gaviiform bird has also been found in the late Oligocene (MP 28) of the Enspel maar lake in Germany (personal observation). Kurochkin (1976) further noted the presence of Colymboides in the late Oligocene of Kazakhstan. An allegedly Paleogene North American species assigned to the Gaviiformes is Gaviella pusilla (Shufeldt 1915), whose holotype consists of a proximal carpomet-acarpus from an unknown locality and horizon in Wyoming. Wetmore (1940) assumed that the specimen comes from Oligocene deposits, and, because of its morphological distinctness, classified it into a monotypic taxon, Gaviellinae. The fossil record shows that Paleogene stem group representatives of the Gaviiformes occurred in limnic environments with a subtropical paleoclimate, but the factors which largely restricted the inland distribution of loons to the northern latitudes are unknown.